With so much pressure all around us on a daily basis, it’s nice to know I’m under none to get this project road worthy. Do I want to do it soon? Of course. Does it have to be done? Nope. But if it’s going to be done, it needs to take the pressure. Hydraulic pressure. And this my friends, is where old parts go bad. 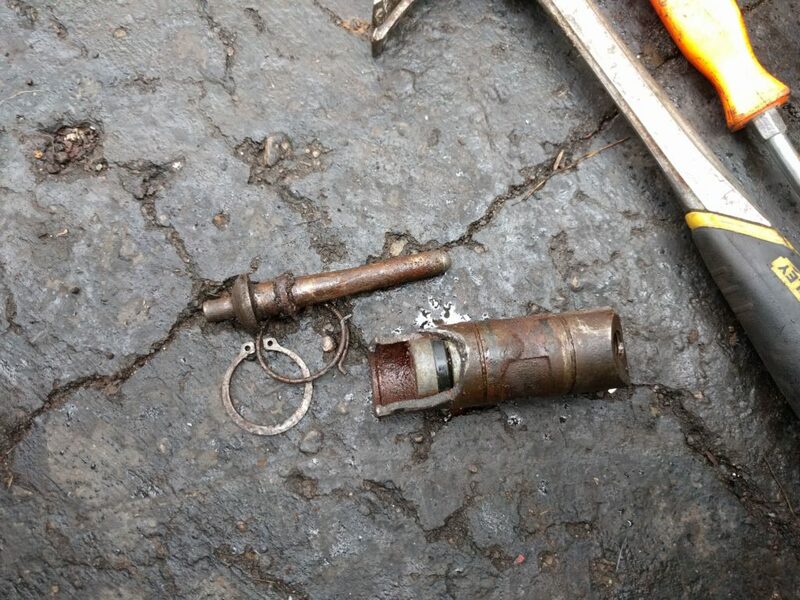 The picture below is the slave cylinder that needed hammer time, break it down, to snap it free. The housing didn’t crack from hitting it though. I used a pipe wrench to try to spin it loose. I’ve since cleaned up the push rod, which needs to be reused, and installed a new slave. But the master clutch cylinder that I rebuilt leaked passed the foot pedals when I thought I was ready for a test run. So that got shipped off to Apple Hydraulics in New York for a resleeve and rebuild. Soon I’ll have it all back together, go for a drive and find out the next old, worn out part that needs replacing. I’m thinking stuck calipers or bad wheel bearings. Thanks Mike! I do try to keep it interesting, if not slightly dirty.